I’ve always loved the idea of foraging. Eating for free from the wild. Enjoying nourishing foods that others might overlook or consider “weeds.” I get giddy when I come across a fruit-heavy black raspberry bush or mulberry tree in the woods, just standing there. Waiting for me to pluck its warm, juicy fruit from the branch and enjoy. It just seems so magical and slightly sacred. But I’ve always assumed foraging was mostly too complicated for me. I figured it was generally too time-consuming, what with the hunting and gathering. I thought it would involve more study than I have to offer right now, getting to know unfamiliar plant names and methods of preparation. 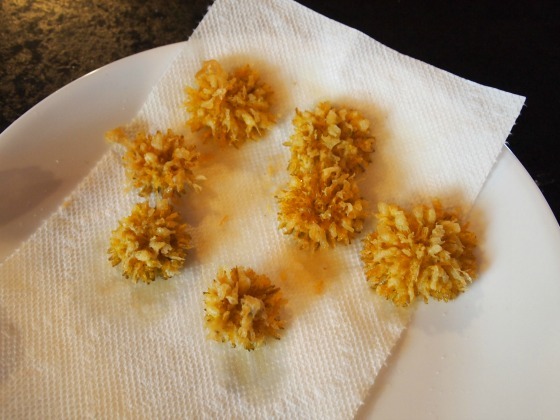 So I was thrilled when I discovered a recipe for tempura (i.e.battered and deep-fried) dandelions. I know dandelions! And I know where to find them! The recipe is quite simple and uses all familiar ingredients. I knew that dandelions were good for you, but I find the leaves and stems way too bitter. I’d never thought to use the flowers! This sounded perfect. And upon further research, I was blown to discover just how incredibly nutritious they are! Their Latin name, Taraxacum officinale, translates roughly as “basic remedy,” as dandelion was once a valued medicinal plant that was cultivated as a general cure-all, especially for liver and kidney care. In fact, dandelions didn’t start out as weeds in North America: they were brought across the ocean as a valuable medicinal plant. Crazy, right? Dandelions are high in iron, Vitamin A and Vitamin C. Why exactly do we consider them our lawn’s nemesis? They’re more valuable than our grass! Anyway, I decided I had to give them a try. 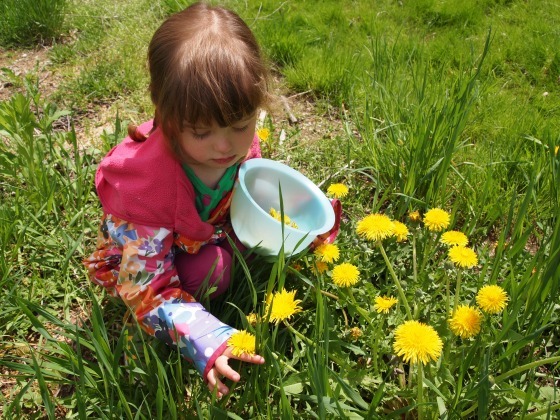 I invited Lydia to join me in gathering some dandelions from our yard (we don’t use sprays or fertilizers on our lawn, so I knew it was safe.) There’s a nice area between our yard and the field next to us where we could gather a nice crop. Of course she loved this part of the activity. And the final results were absolutely delicious! I think I ate about 20 dandelions in one sitting, as soon as they cooled. Lydia liked them all right; Ben loved them paired with my smoky paprika and cumin aoili. Adapted from The Rhythm of the Family by Amanda Blake Soule and Stephen Soule. Note: this batter needs to be very, very thin. Watery, even. It just needs to barely coat the flowers with the thinnest possible film of batter. This will help keep the beautiful dandelion shape and give you a nice, crisp crust while the inside quickly softens. I’ve also read (here) that if you want to reduce the bitter flavour, pull off the bracts (the little downward pointy leaf-like things at the base of the flower head, where the stem attaches). I went ahead and did this, just to make sure our first attempt was as tasty as possible. It’s a little time-consuming, though. You may choose to skip it. Begin by rinsing the dandelion heads. I ran mine through my salad spinner as well, though it’s not too important. They’ll look a little soggy and unappetizing at this point, but they’ll return to their original pretty shape when they’re fried. In a small pot, begin to heat/melt your fat over medium-high heat — you want it to be between 1-2 inches deep. In a small bowl, combine flour and cornstarch. In a second, larger bowl, beat egg until frothy, then add the ice water, vinegar, and salt, and beat some more. Add flour mixture and whisk until just combined (you don’t want to overmix). If needed, add some more ice water until batter is thin and very watery. 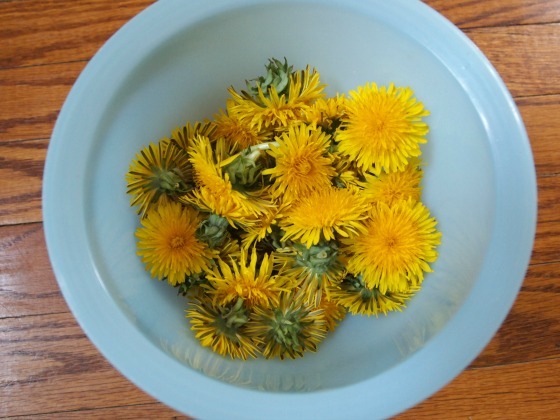 Take your bowl of batter and your bowl of dandelions to your stove. Your fat should be nice and hot by now. Sprinkle a pinch of flour into the fat to test — if it immediately fizzes up, you’re ready. 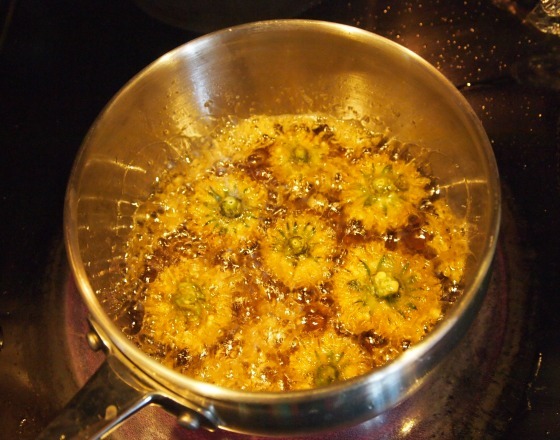 Begin to dip the flower heads into the batter, one at a time, letting the watery batter drip off for a moment before dropping them carefully in the hot fat, petal-side down. Once they’re golden, turn them over with tongs to fry the other side. When both sides are golden, remove dandies with tongs to a paper-towel-lined plate. 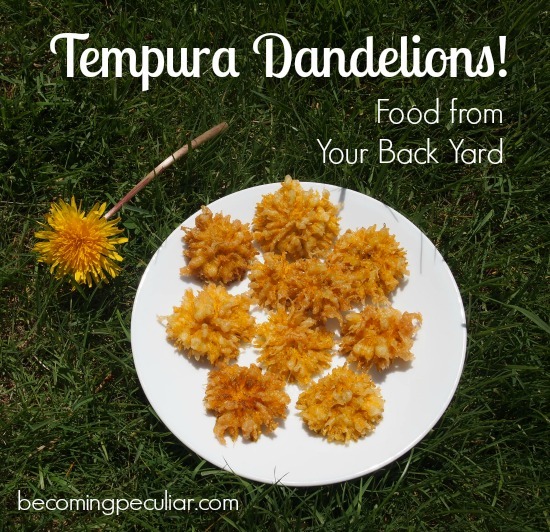 Continue dipping and frying dandelions in batches until they’re all done. Serve alone or with your favourite mayo dip. Yum! 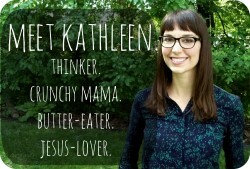 Have you eaten dandelions or other “weeds”? How did you prepare them? Did you like them? I would have loved to try this as a school activity with my girls. They loved picking the dandelions but of course now they are all white fluff. Definitely something to try for next year. I have never tried “weeds” but I am excited to start. Thanks for sharing!!! these look so pretty! I love how puffed up they got. They are so beautiful. Too beautiful to eat! I read that book this winter so I’m glad you reminded me about these! I tried it tonight and they were so yummy! Though not pretty and puffy like yours, so maybe the salad spinner step helps with that. We must be advanced dandelion farmers because we still had a lot of yellow ones to pick. Yes! I love dandelions! 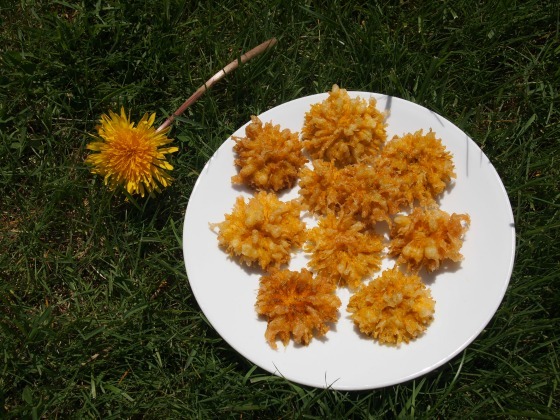 We use the flowers every year to make dandelion wine and this year I made dandelion jelly for the first time. I try and do dandelion fritters at least once a year (very similar to this recipe but dipped in more like a pancake batter.) We still have a few yellow ones about (though most have gone to seed) so maybe I’ll try this tomorrow. Wow! Sounds you’re a dandelion expert already! Those sound amazing!! Perfect reason I don’t need to stress about my lawn anymore!!! Dandelions are one of the few weeds that I feel have an actual purpose. They also make a good tea, suitable for relaxation. Thanks for writing. Aaron C. recently posted..Hello world!